If conducted correctly all should prevent loss of a swarm. However, the individual methods – even the first three which involve the physical separation of the bees in the hive – are not the same. In addition, these swarm control methods do not recapitulate the separation of bees that occurs when a hive naturally swarms. The purpose of this post is to contrast the original and new colony composition of the split-based methods of swarm control (i.e. Pagden and vertical) with natural swarms. I introduced this term when discussing the honey bee colony as a superorganism. It means that adult worker bees have different roles depending upon their age. For the first two and a bit weeks they have duties inside the hive such as cell cleaning, brood rearing and wax production. They then transition through a period of being guard bees before becoming foragers, flying from the hive and collecting water, nectar and pollen. For convenience I’ll refer to these two groups of bees as young, nurse or hive bees and flying bees. The classic Pagden artificial swarm and the vertical split are fundamentally the same process. If unsealed queen cells are found during a colony inspection the queen, with a frame of emerging brood, is moved to a new box. This box is placed on the site of the original hive. The remaining bees and brood are moved, either to one side in the case of the Pagden or on top of the queen-containing box (separated by a split board) in a vertical split. Critically, the new box with the brood and bees is provided with a new hive entrance, located off to one side or on the opposite side of the original hive 1. 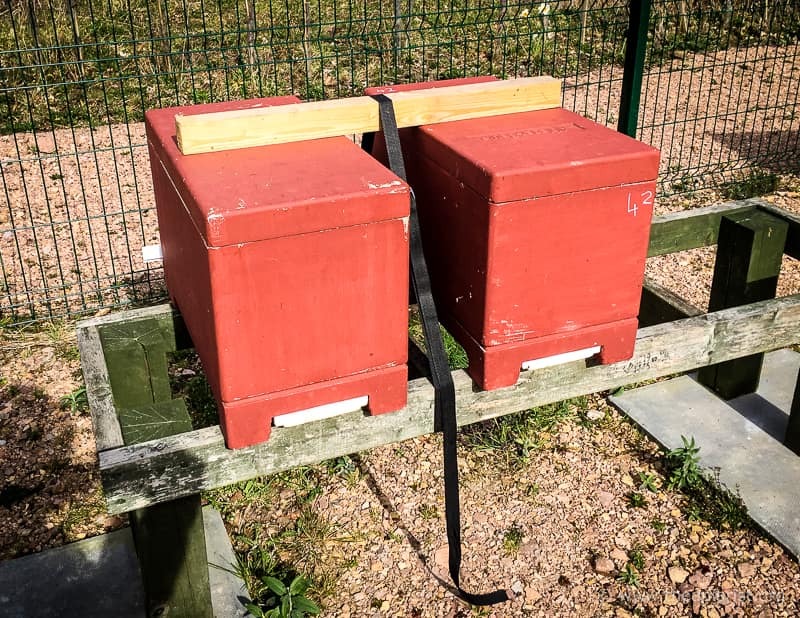 Over the following day or two the flying bees leave the relocated brood box with the new entrance and return to the queen-containing brood box in the original location. The flying bees i.e. those over ~3 weeks of age that had orientated to the original hive location, which are now located with the queen. The nurse bees i.e. those less than 3 weeks old, which remain in the relocated brood box, together with the brood in all stages (eggs, larvae and pupae). How does the artificial swarm compare with the age distribution of bees in a real swarm? I’ve previously discussed prime swarms and casts. The former contain a mated queen. In contrast, casts are produced from very strong colonies after the prime swarm has left. Casts are headed by a virgin queen. These are sometimes called after swarms and are usually smaller than prime swarms. What about the workers in the swarm? What might be expected? Perhaps they’re primarily the older flying bees? After all, these are the bees that have finished their hive duties and are now routinely foraging outside the hive. It’s the natural place for them. Alternatively, remember that swarms have no ‘homing’ instinct for a day or two after emerging. They can be readily moved and you can safely ignore the “less than three feet or more than three miles“ rule. Perhaps this means that they’re primarily young bees that have yet to go on their orientation flights? Enough speculation … how do you determine this experimentally? There have been numerous studies of the age distribution of bees in natural swarms. However, the data tends to be rather contradictory though the methods used are often broadly similar. How do you determine the age composition of workers in a swarm? Essentially you ‘spike’ the colony with a set number of marked bees of a known age over about 8 weeks. This is easy to do, but tedious. Workers are allowed to emerge in an incubator. On the day of emergence (0 days old) they are marked with a colour that distinguishes them from older or younger bees. Every three days 100 identically marked i.e. same age, bees are added to the study hive(s). Over the period May to July this will accumulate red, then yellow, then blue, then mauve, then cyan, then pink etc. cohorts of workers, each representing a known age class. The colony is allowed to swarm, the swarm collected and the number of bees of the different age cohorts in the swarm counted. I missed a step out there. Have you ever tried counting the bees in a swarm? It’s much easier if they don’t move. 1002, 1003, 1004, 1005, er, where was I? Damn! What you end up with is a count of the total number of bees in the swarm and the numbers of bees of each 3 day cohort over the last several weeks. You can therefore determine the age distribution of the workers in the swarm. I’ve actually oversimplified things a bit. There’s a possibility that different age cohorts of bees die within the hive at different rates, perhaps depending upon forage availability or weather or something else. Think about it. Assume there was a dearth of nectar in late May and the blue and red labelled cohorts added during that period were underfed and died prematurely. If there were very low numbers of blue and red bees in the swarm you might assume that these ages were ‘left behind’ by the swarm … when actually they weren’t able to swarm at all. The real question is therefore whether the age distribution of bees in the swarm is similar to that in the parental hive. OK, OK … is it? Swarms do contain bees of all ages. However there are significantly more young bees and many fewer old bees than would be expected from the age distribution of workers in the parental colony. The o and e in the graph above represents the position of the observed and expected median age class for the expected distributions. So, in swarm C the observed median age is ~10 days old, whereas the originating hive median age was ~19 days. The graph above comes from a 1998 study by David Gilley 2 and supports earlier work 3 by Colin Butler 4 which is often cited as one of the definitive studies on the ages of bees in a swarm. Is it surprising that young bees predominate in natural swarms? 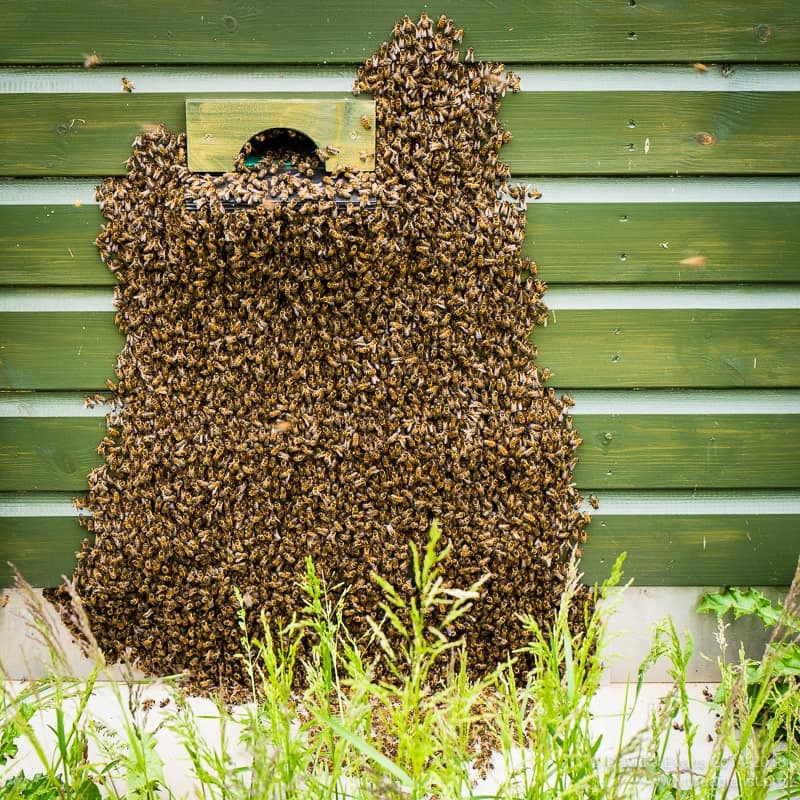 Swarms usually emerge from the hive late morning or early afternoon on warm, sunny days. In fact, at exactly the time most older bees aren’t in the hive anyway because they’re out and about foraging. Remember also that swarming is a precarious activity for the colony. Most swarms do not survive 5. 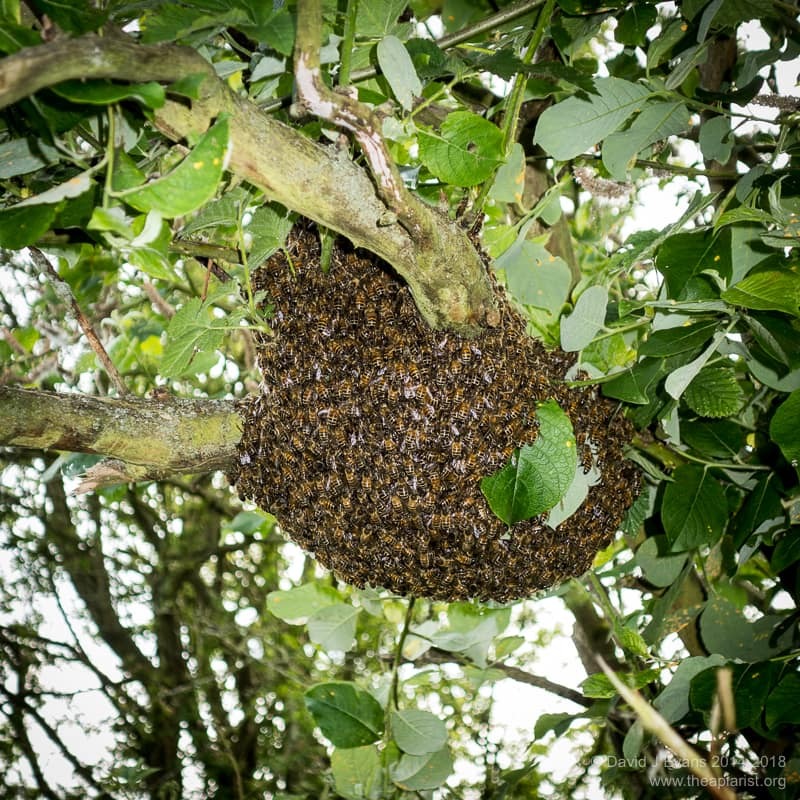 Natural selection will have resulted in swarm populations that maximise their chance of survival. Once bees start foraging their life expectancy is pretty short. It has been estimated that they experience about 10% mortality per day. If only old bees left in the swarm with the queen the newly established colony would very rapidly dwindle in size, perhaps before significant numbers of new brood emerged (which takes 21 days from the first egg being laid). This would likely limit the chances of survival of the new colony. What has this got to do with artificial swarms? As beekeepers (or at least as responsible beekeepers) we spend May and June rushing about like headless chickens trying to control swarming in our bees. Many of us achieve this using a variety of methods which are generically referred to as artificial swarms. I suspect that many beekeepers think that the artificiality is because of our interventions. Where have all my young girls gone? It is … but it’s worth remembering that the artificial swarms we generate are very different in composition to natural swarms. Our artificial swarms predominantly leave the older bees associating with the queen, with the young bees remaining with the brood. These old bees have to draw new comb and rear the new brood. These are activities they last did weeks ago (a long time in the life of a bee). There are artificial swarm control methods that were developed to better replicate the age distribution of bees in a natural swarm. One example of these is use of a Taranov board. I’ll cover this in a future post. It’s also worth noting that the bees of different ages in a natural swarm have different roles even before they occupy a new location. The older bees form a mantle around the bivouacked swarm that protects it from inclement weather (amongst other things) and the oldest bees are the scouts responsible for finding a new nest site. Of necessity these are abbreviated descriptions of these swarm control methods. Please read the more comprehensive accounts of Pagden’s artificial swarm or the vertical split for full details. 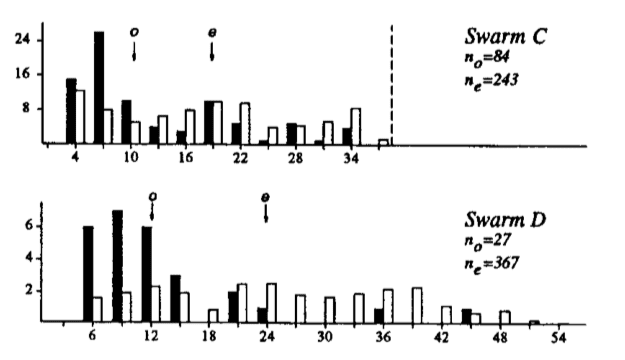 Gilley, D. (1998) The identity of nest-site scouts in honey bee swarms, Apidologie, Springer Verlag 29:229-240. Butler C.G. (1940) The ages of the bees in a swarm, Bee World 21:9-10. Colin Butler was a distinguished entomologist who worked at the Rothamsted Experimental Station in Harpenden where he discovered ‘queen substance’. Butler died in 2016 at the age of 102. I can’t find the citation for this, but it’s probably from Thomas Seeley. 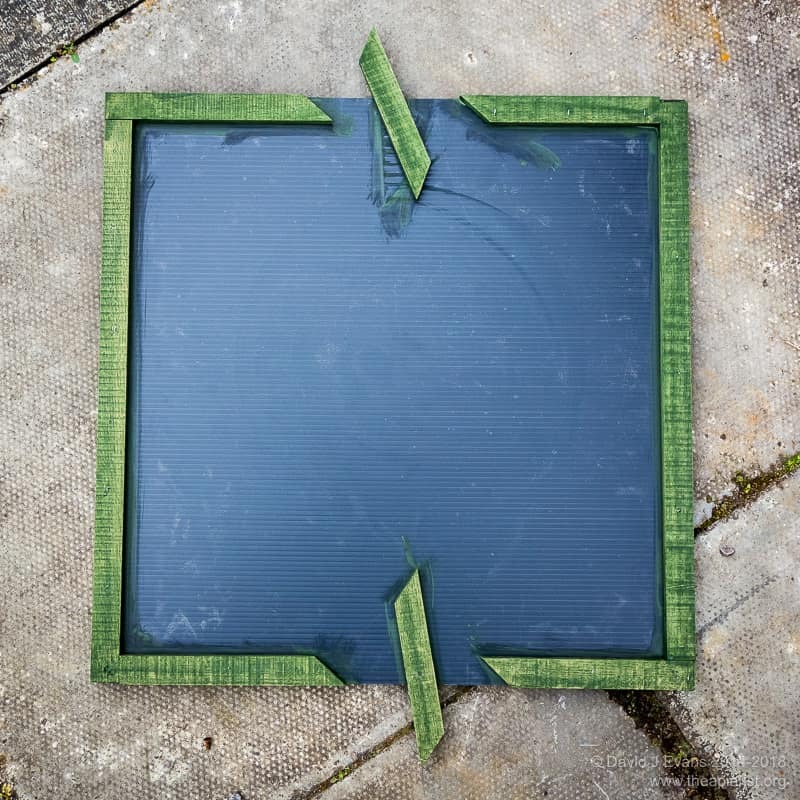 This entry was posted in Beekeeping, Science, Swarm control, Swarms and tagged Butler, Pagden, Taranov on April 12, 2019 by David. Good point 🙂 I should have made it clear that all of my discussion assumed that no supers were present. I also put the supers back on the queenright hive. It’s worth noting that some queenless hives are very good at collecting honey. I noticed this on one of my strong colonies last year … it went queenless (not a swarm) and this coincided with a strong nectar flow. The hive outperformed all of the queenright colonies in the same apiary, and reared a new queen. This prompted me to do a little Googling and it’s clear that some commercial beekeepers make colonies queenless to maximise the honey yield. Perhaps we’re putting the supers back on the wrong box?! What about of Mel Disselkoen’s system called OTS queen rearing but is more like a system of colony management through the year. 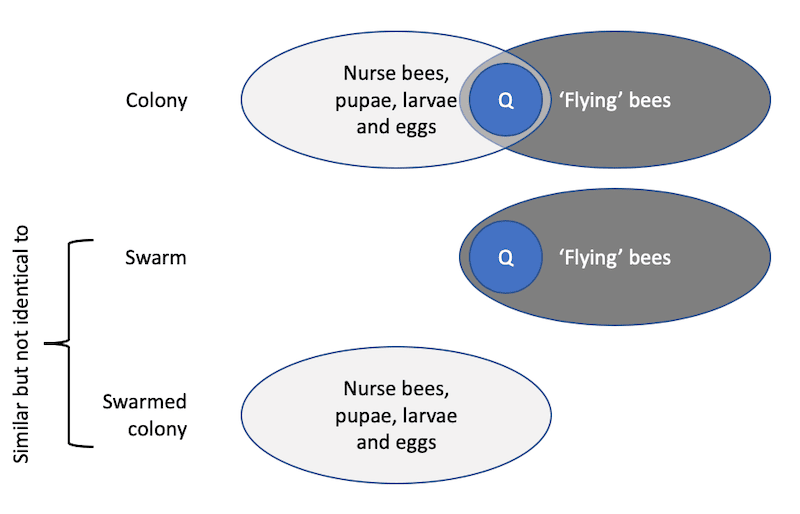 Mel Disselkoen’s OTS (On the spot) queen rearing method looks very similar to the nucleus method of swarm control, though it is proactive rather than reactive i.e. you make up the nuc before they’ve starting making QC’s. You then encourage queen cell production (not that they really need encouragement!) by notching the comb below very young larvae. Potentially the age distribution of the nuc will resemble a natural swarm but, unlike a swarm, it contains brood and is a much smaller proportion of the overall size of the parental colony. Natural swarms contain about 75% of the bees in the colony. The previously described nucleus method and Mel Disselkoen’s OTS method probably only contain ~25-30% of the parental colony. Thanks David. I’m thinking of trying this method as an experiment as it feels as if the beekeeper is more in control rather than trying to second guess when the bees are going to make queen cells. With regular inspections you should be able to ‘catch’ the queen cells in time without having to guess at all. I’ve not tried the OTS method. I suspect it’s important to ensure that the parental colony is good and strong before starting.